▶ SoldThis listing was sold on Mar 16, 2018 for the price shown here. 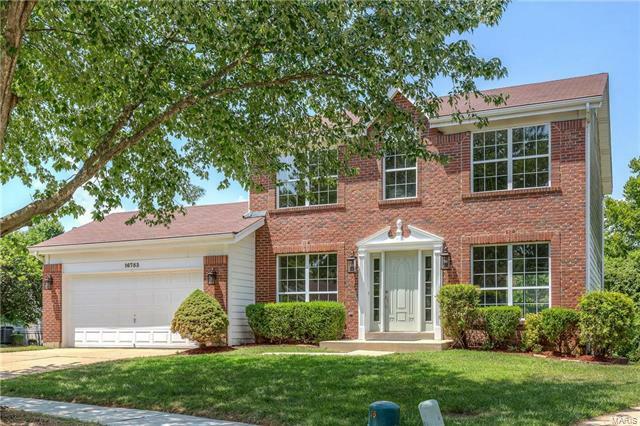 Outstanding brick 2-Sty beautifully renovated throughout! Located on a private cul-de-sac lot in sought after Chesterfield Farms. Impressive 2-sty entry foyer leads to formal living & dining rooms—perfect for entertaining—and spacious family room with wall of windows overlooking wooded ground. Spacious open kitchen with custom cabinetry, granite countertops, center island & convenient planning center adjoins light-filled breakfast room with sliding glass door that opens to deck. Vaulted master bedroom suite offers an appealing retreat with huge walk-in closet & luxury master bath with Jacuzzi. 2 Large additional bedrooms, 4th bedroom/office & hall full bath complete the 2nd floor living quarters. Grounds include deep backyard, deck, patio & 2-car garage. Neighborhood community with clubhouse, tennis court, pool & swim team. Convenient Chesterfield location just minutes away from shopping, restaurants & parks with easy access to Hwy 40. Award-winning Wild Horse Elementary.